To reserve a spot for fall 2018 or spring 2019 school year, please contact Raquel at (505) 820-1696 or raquel@santafewatershed.org. Classes being scheduled for fall 2018 and spring 2019 are funded by the Lineberry Foundation and the City of Santa Fe. 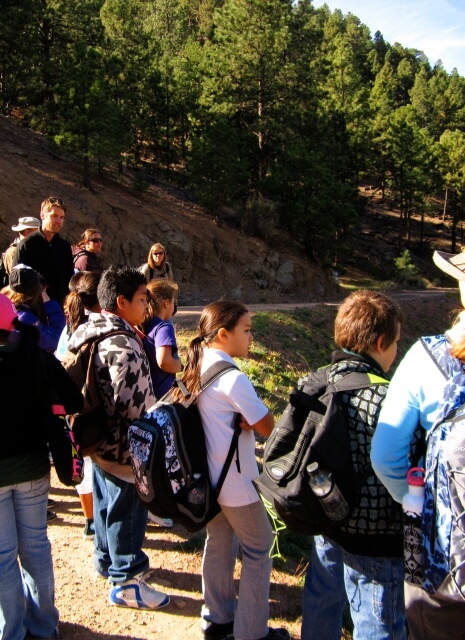 My Water, My Watershed is an experiential, science-based program for fourth and fifth grade Santa Fe Public School students to study and explore their watershed, learning about the complex relationships between living things and their environment. During a one hour pre-visit in the classroom, students will be introduced to a short history of the Santa Fe River and learn the definition of a watershed. The full day field trip will occur in the upper watershed of the Santa Fe River, an area that has been closed to the public since 1932. We have been granted unique access to explore this area with your students and to see first-hand where our water comes from. During the field visit, students will use their observation, questioning and data collection skills to explore this rich environment. In the one hour post-visit, students will review and evaluate the data collected and reflect upon the new concepts learned. 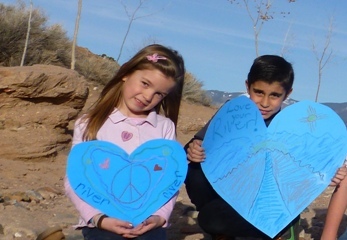 Exploring ideas for water conservation,students will revisit the connections between the watershed, Santa Fe River, Rio Grande River, and the water we use in our schools, homes, and community. My Water, My Watershed is FREE for all fourth and fifth grade SFPS classes, but space is limited. SIGN UP EARLY TO ENSURE YOUR SPACE. Day One: One hour pre-visit to classroom. Define a watershed and map out the Santa Fe River and its watershed. Prepare for field trip. Day Two: Full school day field trip to upper watershed to practice exploration, observation, and data collection. Sampling of aquatic macroinvertebrates in the Santa Fe River using a dichotomous key and wildlife observation. Day Three: One hour post-visit to classroom. Review field program findings and evaluation activity. Explore ideas for water conservation and revisit where we get our water from. This program is funded by the City of Santa Fe. To sign up or if you have questions, please contact Raquel at (505) 820-1696.